Terra Maltese is peacefully located next to Ftelias Beach within 3 km from the cosmopolitan Mykonos Town. It includes an on-site restaurant and offers rooms with private balconies enjoying views of the sea and the surroundings. 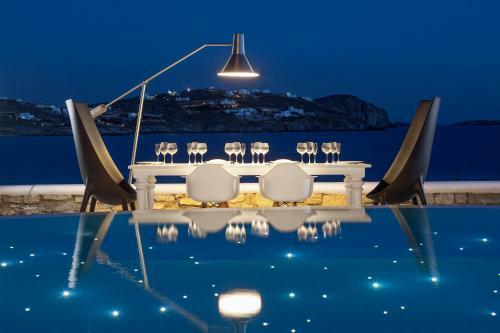 Golden Star is a 4-star hotel located in the Town of Mykonos. The hotel offers a swimming pool with hydromassage and a pool bar. The beach is just 200m away. All rooms have private balconies, most with spectacular views of the sea. Just 200 metres from Ornos Beach in Mykonos, Cycladic-style Hotel Dorion features a pool and stylish rooms with balcony overlooking the Aegean Sea. It offers a rich breakfast and Wi-Fi internet access. Situated on Megali Ammos beach, Mykonos Bay is just 300m away from Mykonos town. It offers a pool with views of the sunset, the sea and the island� trademark windmills. 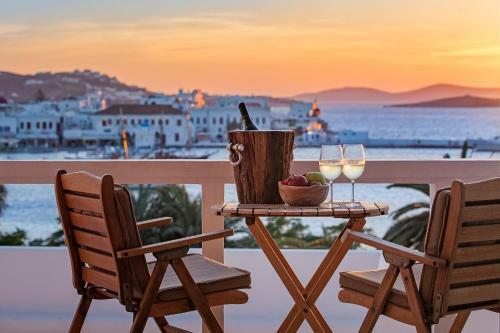 Ideally located next to the old port of Mykonos and in the heart of its shopping and nightlife district, this boutique hotel offers stylish accommodation with stunning sea views. 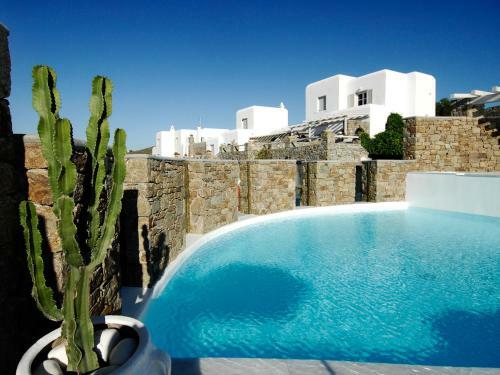 The gay hotel Elysium boasts tasteful accommodation and a swimming pool with views of the windmills and Mykonos Town. Guests can use the hotel�s gym and hot tub. 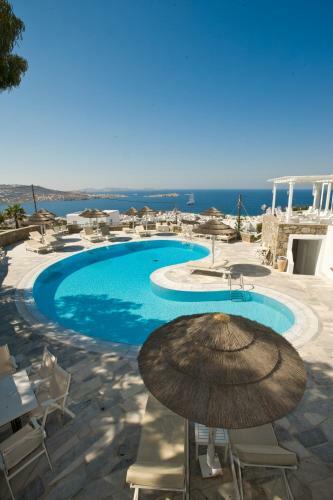 Just 500 metres from Mykonos centre, the 4-star Hermes Hotel features a swimming pool and free WiFi. 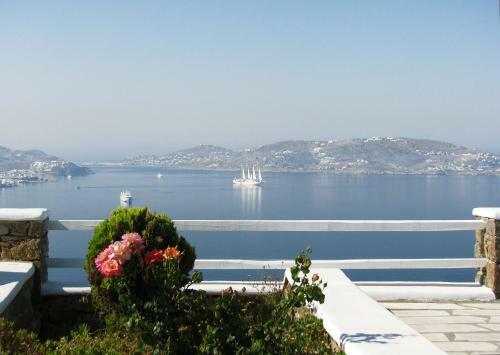 The elegant rooms have a furnished balcony overlooking the Aegean Sea or the hotel gardens. Just a short walk from Mykonos� town centre and Little Venice and 1-minute walk from Fabrika Square, the family-run Hotel Adonis provides a variety of spacious accommodation, close to all the main attractions. Boasting 3 outdoor pools with sunbeds, Aeri Villas & Studios is located in Tourlos village. 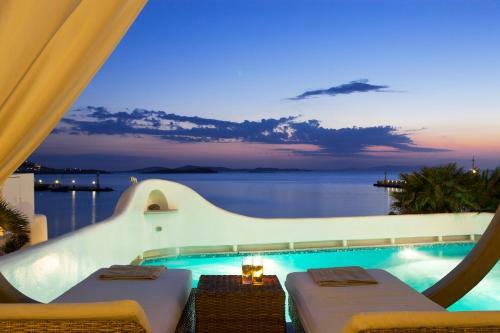 It offers Cycladic-style accommodation opening out to a balcony or patio with Aegean Sea and garden views. Free WiFi is provided throughout. Overlooking Delos Island, De.Light Hotel offers spacious and air-conditioned suites with a terrace or balcony boasting Aegean Sea views. It features an outdoor swimming pool, hot tub and free Wi-Fi throughout. Located 100 metres from Agios Ioannis Beach, the brand-new Lithos by Spyros & Flora is a whitewashed complex offering modernly designed accommodation with a furnished balcony. 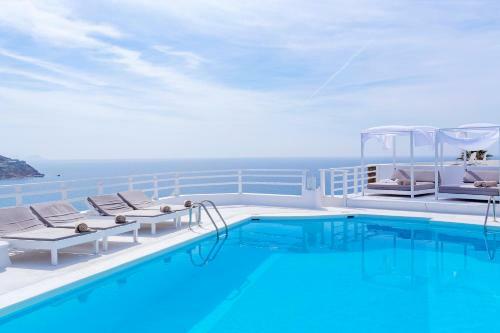 This chic hotel in Mykonos� Chora offers a magnificent swimming pool with sunset views, a 24-hour state-of-the-art gym, gourmet restaurant and airy rooms with beautiful sea views. Set on the hillside facing the bay of Ftelia, this Mykonian-style boutique hotel offers rooms with views over the Aegean Sea. The quiet Ftelia beach, famous for windsurfing, is 600 metres away. 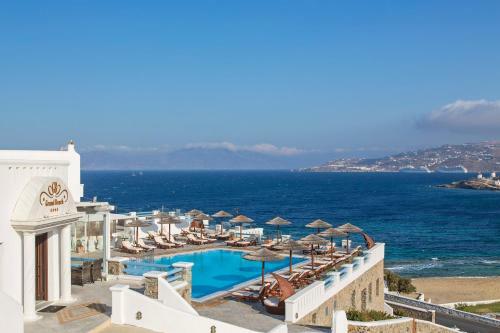 With magnificent views over the sea and the famous windmills of Mykonos Town, Ilio Maris boasts elegant guestrooms with Wi-Fi and 32�� TV and quick access to the beaches by bus. 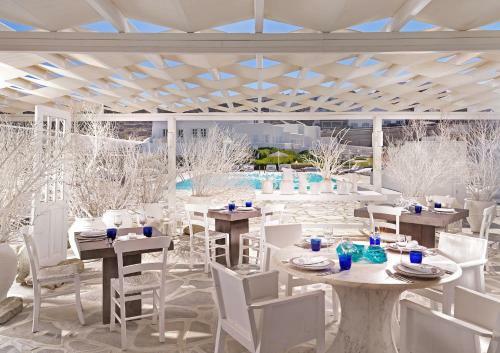 Located on a small hilltop overlooking Mykonos Town, Andronikos Hotel boasts an award-winning restaurant and also features an outdoor pool and wellness centre. 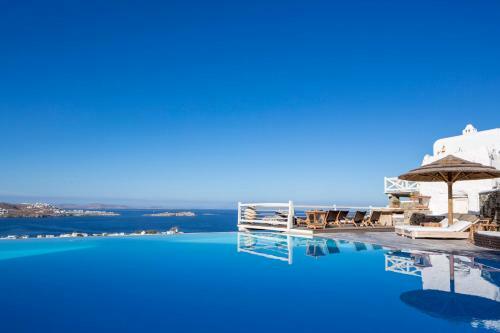 Located on a hilltop, the Ostraco Suites, part of the Small Luxury Hotels of the World, offers breathtaking views over the Aegean Sea. This luxury boutique hotel features a freeform pool with a sun terrace and a stylish cocktail bar. 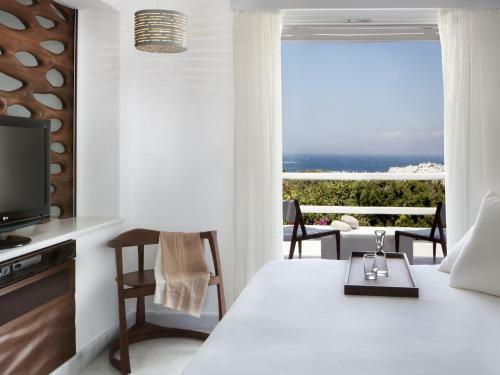 The 4-star Leto Hotel has a wonderful panoramic position overlooking the old port of Mykonos. It offers an outdoor pool with poolside bar and a 24-hour front desk. All rooms have a balcony overlooking the port and the Aegean Sea.